Serving our community and the next generation of hearts and minds is a top priority for Plenitud. See below for list of our ongoing Youth and Community Programs, and contact us for more information about how you can participate. We have cultivated relationships with several local partner schools over many years, providing workshops in gardening, sustainable technologies, and living art skills both in the schools and at our Teaching Center. We work with groups of all ages to provide classes and workshops on any of our specialty areas. 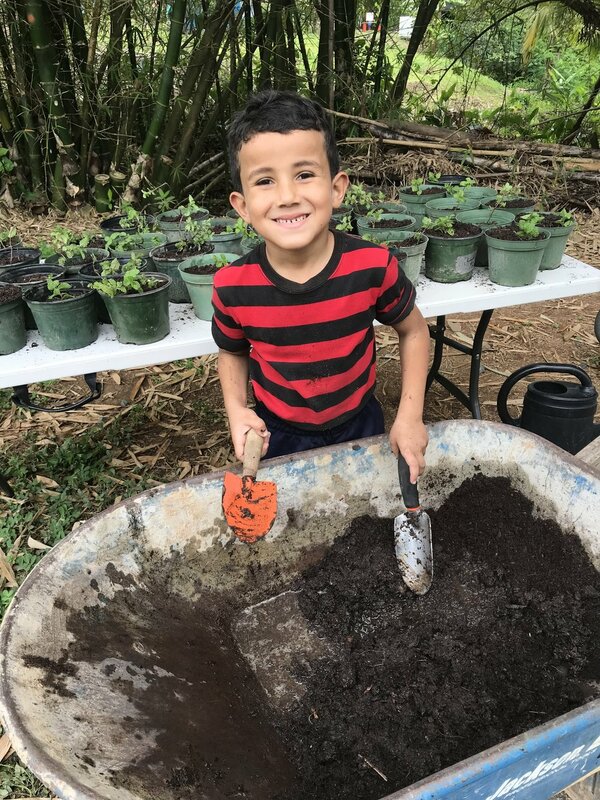 We have established 4 long term school partnerships with local schools from Las Marías, Maricao, and Añasco where we have collaborated on school gardens, art workshops, the installation of rainwater harvesting systems, and the integration of sustainability concepts into classroom curriculum. The continuity of working with the same partner schools has allowed us cultivate a relationship with the students and grow together. In partnership with the Fundación Comunitaria de P.R., we are providing a series of workshops on rainwater education as well as installing rainwater harvesting tanks for 20 local families and one of our partner schools, La Escuela Superior Luis Muñoz Marin in Añasco. This program is a major component in our larger Hurricane Relief and Rebuilding effort across the island, directly benefiting children and families affected by Hurricane Maria in 2017 and providing them with the knowledge and resources to weather any future storm with clean rainwater. Plenitud has joined efforts with the Hispanic Federation to provide education on Superadobe construction, a safe, renewable, and affordable housing or emergency shelter alternative for those whose homes were affected by the hurricane. Through a series of workshops, participants gain knowledge, skills, and insight into this hurricane- and earthquake-proof technology that they can implement and share with others across the island. Serving and joining with our neighbors and local community is the hallmark of Plenitud’s mission. Please come and join us for one of our regular community events! Free Yoga Classes: every Wednesday at 5:30 pm at the Teaching Center. Bring a mat, comfortable clothes, a bottle of water, and a desire to learn and grow together through our community practice. Monthly Service Parties: each month we gather as a group to engage in a day of service to community members, assisting in farm or home projects depending on the need. This is a meaningful and inspiring way to directly impact the lives of someone in our community! Contact us for more information.